Follow the news that matters to you with CNN.com's new personalized news tracking service. Select topics and interests, such as people, locations, places and issues. CNN.com will send you an e-mail alert free of charge each time a story is published that matches the subjects you have selected. Read more about member benefits. Customize up to 30 alerts. Choose from keyword alerts appearing on current CNN.com stories and/or create your own alerts by entering your own keywords. Add the most popular alerts. Read what others are reading and add the top alerts to your profile. 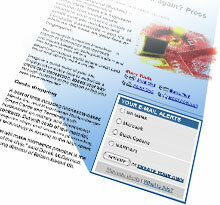 Learn more about Your E-mail alerts, visit our alerts tour. Alert your friends and colleagues about this service. NOT A CNN MEMBER YET? Become one! The membership is free and includes e-mail alerts and many more services all free!